In our last blogpost, we compared the SIELE and DELE exams of Spanish language competency. We showed you that – as far as status and content goes – they are twins, sharing the Instituto Cervantes as parent. They have the same curriculum and scoring criteria. The essential difference is in form; the SIELE is the new online version, with all the flexibility and fast turn-around that modern technology makes possible. As director of studies of DELEhelp and PROBIGUA (the latter our residential arm here in La Antigua Guatemala, which is an accredited SIELE exam center) I am also the official coordinator of the Antigua exam center. Here are some of my observations about how the new SIELE is performing in real life. Summed up: the SIELE exam is fast, flexible and fail-proof. FAST: How quickly can you get your results for the new online SIELE exam? SIELE’s promise is within three weeks max. However, we had a candidate do the S3 module (Listening Comprehension + Oral Expression) on a Saturday, and her results were ready on Tuesday! What is noteworthy, is that this particular exam module that she did, included oral – meaning that it wasn’t simply multiple-choice questions marked by computer, but that it needed to be listened to and assessed, in person, by qualified examiners. This turn-around is light years ahead of the DELE’s waiting time of two to three months, plus months more to receive your actual diploma via snail-mail. Another time-related issue that sets the SIELE apart from its twin, the examen DELE, is that our candidates could register online and receive confirmed times and dates for sitting their SIELE exams, just 48 hours before the exam dates chosen. Instead of the DELE’s limitation to half a dozen fixed dates per year, the SIELE can be taken on practically any date of your choice, and at very short notice, if need be. Very importantly, your SIELE date is immediately and definitively confirmed. In the case of the DELE, on the other hand, candidates need to wait for confirmation at the end of the registration period, which often then results in disappointment (i.e., registration refused) if the particular exam center couldn’t meet the requirements for having oral examiners in place for the candidate’s chosen level, on the set date. FAIL-PROOF: Are you worried that, since for the DELE you MUST select a particular exam level to attempt, you may aim too high and then fail? Perhaps because of failing just one particular exam unit? This risk is inherent in the DELE, because it is a single-level exam – meaning that it isn’t your general communicative competency in Spanish that is certified, but whether you meet all of the thresholds for the particular level you enrolled for (resulting rather bluntly in either an “apto” or “no apto”, meaning a pass or a fail). The SIELE overcomes the dilemma of what level to aim for, because it is a multi-level exam. This means that your result for each exam segment is stated as a number (out of 250) which is then translated into your level of competency – for instance, if you score between 125 and 175 out of 250 in the Oral Expression segment, that translates into a B1 grading. You will get such an indvidualized grading of your level for each of the four communicative competencies – you could, for example, be assessed as B1 for Oral Expression, B2 for Reading Comprehension, A2 for Listening Comprehension, and B1 for Expression in Writing. This is a far more satisfying result than simply hearing you’ve utterly failed B2, if that was the DELE level you had enrolled for. 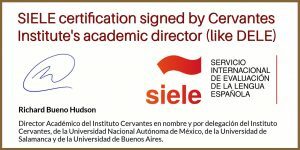 (Again – the levels for DELE and SIELE are exactly the same, as are the curricula and the scoring criteria, and both exams are overseen by Spain’s Instituto Cervantes – see the image below, showing the signature of the Instituto’s Academic Director on a set of actual SIELE exam results). With our students, we have seen in practice the value of the more flexible yet also more exact certification of SIELE, compared to DELE. It is far better to be told that you actually scored 175 for the oral, and thus be certified at B1 (i.e., you got the top B1 score in this) than to be simply told you’ve failed B2, if you had aimed just one point too high by enrolling for the latter (a B2 grading in the oral starts at 176). What the above means, is that the SIELE exam is virtually fail-proof. It is like a blood test, which realistically shows where you are placed on the spectrum – not whether you pass or fail a certain arbitrary level. I suppose somebody with no competency in Spanish at all, may in theory fail to obtain even an A1 level, but for the normal student the SIELE’s format eliminates the risk of ending up empty-handed if you had aimed a bit too high (which could have serious consequences, if you urgently needed certification for job advancement, university acceptance or some other formal purpose). IMPORTANT TIP: While YOU may not be at risk of “failing” the SIELE exam, technology isn’t failproof – as anybody who’s been using Skype, or any internet-based service, can testify. It can – and it does – unfortunately happen that, due to circumstances outside of the control of Madrid or your local exam center, the internet connection fails, making taking (or finishing) the exam impossible at that time. This means the particular segment of the exam needs to be re-scheduled, typically for the next day. Therefore, if you are attending an immersion course at a school that’s an accredited exam center (like our PROBIGUA here in La Antigua Guatemala), don’t leave the exam till the very last day – schedule it for two or three days before your departure, so that it can be repeated if technology failure had occurred. It is also important to note that the exam centers for SIELE set their own schedules for exam sessions (which you will see advertised on the www.siele.org website). Local exam center coordinators can add to, or change their schedule of sessions for a given day 48-hours ahead. You could, therefore, reach out to your center of choice (if, for example, you have some reason for needing to do the exam after hours) and see if they would schedule a session convenient for you, which you can then select when you register. I have been most impressed with SIELE’s support service, which runs 24/7 (keeping in mind that there are exam centers around the world). This high level of back-up is provided by the IT giant Telefonica’s educational division, which is the technology partner of the Instituto Cervantes. 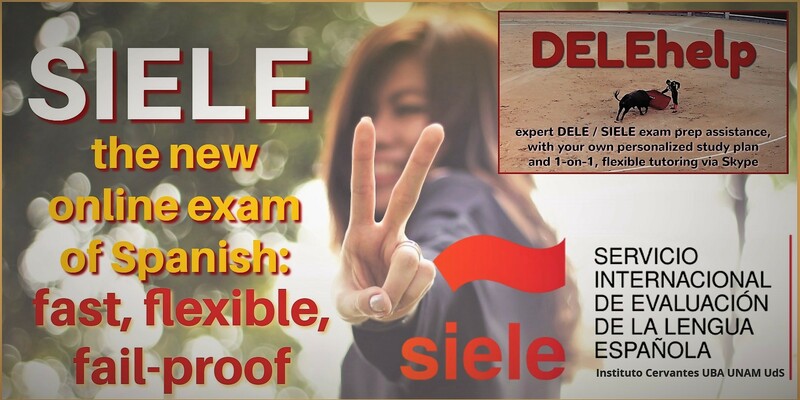 One of the further practical benefits of the SIELE exam format over the DELE, is that you will be doing the exam seated in front of a tested and certified high-powered computer dedicated to just your use, with broadband cable connection (i.e., not wifi) and a set of proper ear-covering earphones with microphone. 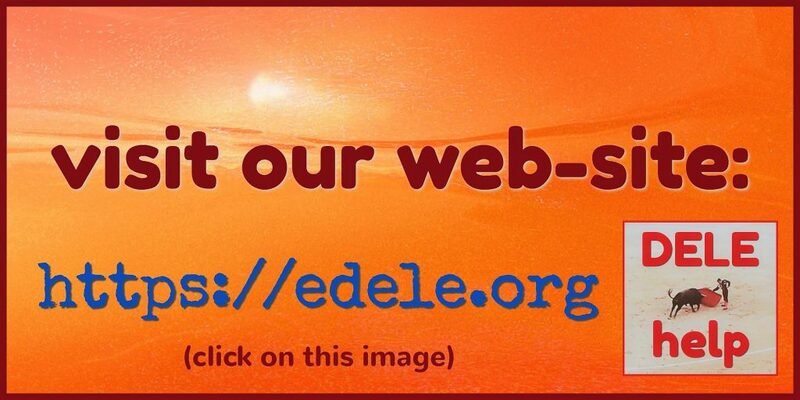 This is very useful for the Listening Comprehension part of the exam, which in the case of the DELE is often done in large groups seated together in an exam hall and having to listen to the audio being played over a public-address system. Because the SIELE exam is offered every day of the week (at our center we offer it Mondays through Saturdays) there is also very little likelihood of the crowding that often goes with the DELE’s handful of fixed exam dates. If you’ve basically lost the skill of writing legibly by hand (or if your fingers are no longer fit for three hours of such torture!) then the fact that the SIELE exam is typed on a keyboard and not written long-hand like the DELE, is another advantage. Lest you think that I’m putting down the DELE, let me conclude by saying again that these two exams aren’t in competition – they are twins from the same family. To me (being very proud of my own DELE C2 diploma) it is simply great that the Instituto Cervantes has teamed up with excellent partners, to bring serious students of the Spanish language faster, more flexible options. There will always be a place for the examen DELE (please note, for instance, that the C2 can only be done as DELE). But for students who are under pressure to show certification quickly for college admission, work or the like, the SIELE exam is a great alternative. 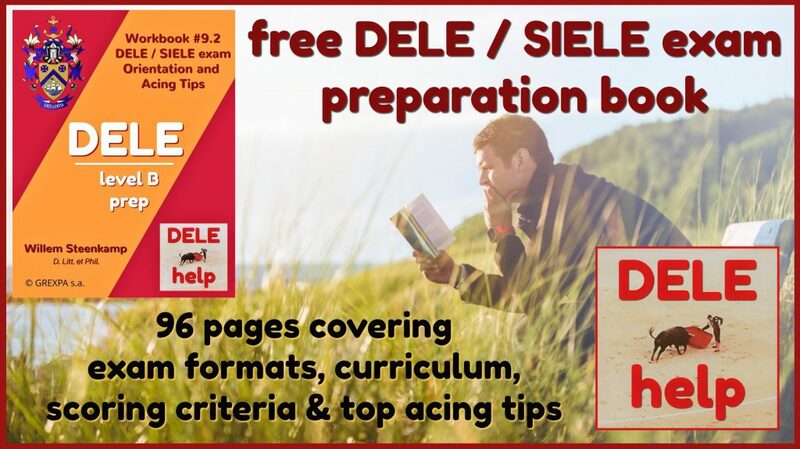 It is also our recommendation to our own students that they do the SIELE as a stepping stone – a very useful independent diagnostic and familiarization – on their way to eventual top-level DELE success. 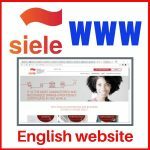 If you do the demo SIELE exam via this link: https://siele.org/web/guest/examen I am sure that you will agree that the SIELE exam is fast, flexible and fail-proof. If you want to know more about the DELE / SIELE exam curriculum and scoring criteria, you may find our FREE 96-page in-house workbook #9 called Exam Orientation and Acing Tips very useful. To receive a download link for this e-book, absolutely free and with no obligation, simply click on the image above to open our contact information form, and send that to me, so that I may then e-mail the link to you. We also offer a free, one-hour exploratory Skype session, through which you could find out if our exam prep services could be of value to you. I would indeed like to take advantage of the 1 hour skyp offer to find out what my needs are to sit Dele level A2. Interested in finding out where I would stand if I took the test as of now.